Longtime readers will know that I love the intersection of plant breeding and great food, which is why I was so excited when looking through Richters Herbs' website, I noticed their mint offerings. I know the usual varieties: spearmint, peppermint, apple, pineapple, and chocolate mint, but here was a whole new range of mints with names like 'Candy Lime', 'Wintergreen', 'Berries and Cream', and even 'Oregano-thyme'! Reading the descriptions got me even more excited. These are part of a whole series of varieties developed by one Jim Westerfield who, in addition to being a plant breeder and mint enthusiast, is creator of an award winning gourmet restaurant, Westerfield House! I had to order some. As soon as the box arrived, I pulled them out and start sniffing and nibbling my way through the selections. I wasn't disappointed. We're talking whole new sets of flavors here. I can't wait to start cooking with them! And they're mints, which means easy (sometimes too easy...) to grow! I was skeptical about this one... really? Wintergreen? The dominate flavor is still mint, but there is a pronounced real winter green flavor as well! It also must have a really high methol concentration, because chewing a leaf fills your mouth with that distinctive tingly cooling sensation. I love making mint lemonade... this variety would be perfect for it! Or a mint-berry smoothie! Or... so much more! I hope this guy is a vigorous as most mints, because I'm going to be harvesting a lot of it. Again, I had to order this one because I couldn't quite believe it. Chewing a leaf, I don't know if I'd say oregano or thyme, but the flavor is definitely some sort of cross between mint and something of the rosemary-oregano-sage-thyme ilk. It really feels like a NEW flavor to play with! I can't wait to get it in the kitchen. This one is delicious. I mean, really, really delicious. Perhaps my favorite flavor just nibbling the leaves straight off the plant. It does indeed have a hint of lime to it, enough to make my boyfriend instantly say "Mojito!" I was a little disappointed here. This one tastes like mint. A very good mint, but nothing extraordinary. In other company, I would probably rave about it, but when the others are so delicious, I don't think I'll really ever use this one. This one is also quite delicious, and surprisingly has a definite orange flavor to it. My first thought was that this is what I wish mint chocolate chip ice cream tasted like. Now I might have to get an ice cream maker... The tag recommends putting it in orange juice. I might just have to try that. All my roses are covered with different colored strings! Why strings? Because, after nearly a decade, I've become re-interested in rose breeding, and all those little strings are marking developing hips I pollinated over the past couple weeks. Roses were my first love when I got seriously into gardening and breeding as a teenager, but somehow the romance faded and I focused on other things. The, last year, on a whim, I made a couple crosses between some of my very favorite roses. And once I had seedlings germinating, all the excitement and joy of the relationship when it was new came flooding back, and I knew I had to start crossing them again. Now I've got this, perhaps the most exciting thing there is in the world. The first bud on a seedling rose. Inside that tiny bud is a flower, never been seen before in the world. I'm hoping, hoping, it will be fragrant and richly colored, but I don't know. No one knows. This new rose awaits discovery. And next year, I'll have LOTS more mysterious new roses unveiling their unique beauty for the first time before my eyes. Ah, the JOY of rose breeding! Gardeners LOVE to complain about plants changing their scientific names. I certainly do it as much as anyone else (I even sing about it) but, though I certainly wish the new names could be easier to spell and pronounce, I actually don't mind it too much. Let me explain. Scientific classification of organisms changes are we learn more about them. Go far enough back in time, and people classified whales as fish. As we learned more about them, however, that classification became obviously incorrect. Whales may live in the ocean, like fish, but they breath air, are warm blooded, and produce milk. Whales, it is clear, are mammals, like us and dogs and elephants, not fish. So the official classification changed. For as long as scientists have been classifying things, they've been doing it based primarily on what they look like. Taxonomists peer at tiny details of flower structure and pollen grain shape and decide "I think that's an aster" or "Salvia, for sure." Recently, however, there has been a revolution. We've started looking at plant's DNA. DNA sequence is the ultimate answer for deciding what is most similar. Two plants may look similar, but look at their DNA, and you can see exactly how different they are. The result has been chaos in the world of scientific names. The genus Aster has been split into a billion pieces. Your Sedum 'Autumn Joy' is now Hylotelephium. It is frustrating (though, you gotta admit, Hylotelephium is REALLY fun to say!) but there is good news. You can't get any more fundamental than DNA sequence, so once this wave of revisions is over, names should be more stable than they have been in the past. 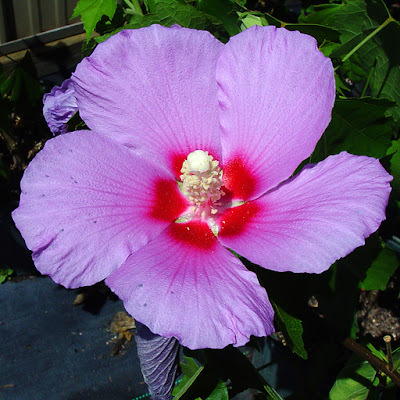 Hibiscus 'Tosca' (image from Arrowhead Alpines -- where you can buy it!) This is a hybrid between H. syriacus and H. mutabilis with bigger flowers on a bigger, more vigorous plant! Knowing it as althea would only result in unsuccessful attempts to cross it with a mallow. Better names make for better breeding which means better plants for you in your garden. They take the typically frilled dianthus petals to a new extreme, creating a cloud of lace when in full bloom! And they don't mess around when it comes to blooming either. This mass in my back nursery bed (holding space for plants I'm trying or just don't know where to put) has been blooming like this for a couple weeks. What's more, they're fragrant. A sweet, clear spicy fragrance... if you could bottle it unchanged into a perfume, and you'd make a fortune. I grew my plants from seed -- which was prefectly easy and straightforward. The first year, they bloomed a little, but now, in their second year, they are REALLY showing me what they can do. I want more. Lots and lots more! I love how the rosettes of succulents often look like flowers. This one reminds me of a gerbera daisy! And fully hardy with reasonable drainage. Mine is in a fairly well drained spot in the open garden (ie, not a rock garden) and has been fine, even this year of the never ending rain. I got mine, of course, from the amazing folks at Arrowhead Alpines, though other people carry it as well.